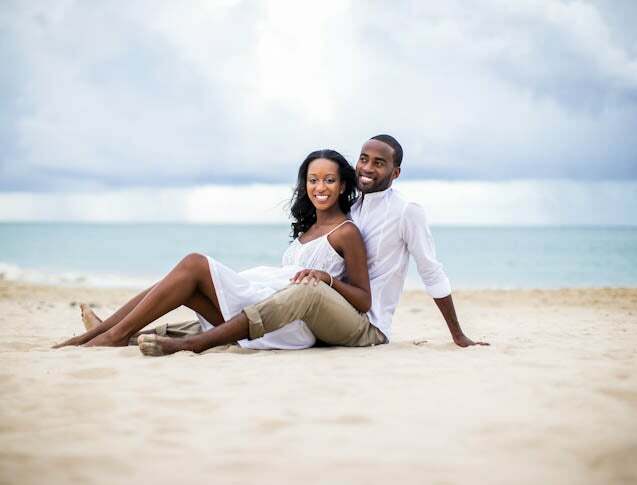 Jazmyn met her groom-to-be Marquette during her freshman year at Spelman college. Their sweet best friends-turned-soulmates love story will make anyone a believer. Let's celebrate their love! We met during Morehouse College and Spelman College’s Brother/Sister exchange ceremony. Each Spelmanite is paired with a man of Morehouse. Technically, you are forbidden from entering a romantic relationship with your Morehouse brother or Spelman sister. Thankfully, fate would have it that Marquette was one person behind me, so his roommate ended up being my Morehouse brother. As I spent more time with my Morehouse brother, I got to know Marquette better, too. We definitely clicked right away. After getting to know him, I really liked him and I could see that we had potential for a long-term relationship. For that reason I tried to keep things as platonic as possible for the first few years of college, knowing that serious relationships during college are often tumultuous and that we both needed time to mature. What’s the sweetest thing he’s ever done for you? He’s done many amazing things for me, but one of the most touching was when he flew out from Virginia Beach to Los Angeles, last minute, to attend my grandma’s funeral. I was really close to her and losing her was extremely hard on me. We were in a long-distance relationship at the time and didn’t get to see each other very often, so it really meant a lot to me that he sacrificed a happy and fun trip that we could’ve taken another weekend to support me during my time of grief. Shortly after graduation, I took a trip to Europe with my best friend, Bianca. During that trip we stayed with his parents in Italy for a few days, and I got to know them better, without him around. Up until that time, I had been somewhat skeptical of Marquette. We seemed perfect for each other, but I still had my guard up a bit, and I was waiting for something to be wrong with him because he seemed too good to be true. After spending time with the people who raised him, I realized that he really is as amazing as he seems, and that’s because two awesome individuals raised him. A few days after Christmas, he visited me in my hometown of Hayward, California. He told me he was taking me on a special surprise date for our three-year anniversary, and popped the question overlooking the Pacific Ocean in San Francisco. He hired a photographer who caught the whole thing on camera and it was one of the best moments of my life. Afterwards, we celebrated with my family and closest friends, and the next day we left for Thailand to bring in the New Year.